Comet 219552A Drive Unit. Replaces Murray 1201404 CVT Drive Clutch. Comet 203814A. Manco 5957 Drive Unit, American SportWorks Part 14716, Manco 14716. Home > Comet Clutches and Parts > Comet 219278A 3/4" Bore Fixed Face and Post for 30 Series > Comet 219552A Drive Clutch. Genuine Comet 30 Series Torq-A-Verter Drive Clutch: 3/4" Bore. 3/16" Keyway. Comet 219552A Drive Clutch. Genuine Comet 30 Series Drive Clutch: 3/4" Bore. 3/16" Keyway. Replaces Murray 1201404 CVT Drive Clutch. Comet 203814A. Manco 5957 Drive Unit, American SportWorks 14716, Manco 14716. Comet 219552-A Clutch. Genuine COMET INDUSTRIES part. NOT AN IMPORTED KNOCK-OFF! Comet 30 Series Torq-A-Verter Drive Clutch: 3/4" Bore. 3/16" Keyway. Replaces Murray 1201404 CVT Drive Clutch. Replaces Comet 203814A 30 Series Drive Clutch. Replaces Manco 5957 Drive Unit, Replaces American SportWorks Part 14716, and Manco 14716. Requires 3/4" Wide, Asymmetric Drive belts. Great for machines that require extra-rugged driving ability. Replaces those found on Yerf Dog (Flexible Flyer), Ken-Bar, Carter, Kartco and MANCO Go Karts, Boonie/Mini-bikes, UTV's and grounds maintenance equipment. Comet 219278A 3/4" Bore Fixed Face and Post for Comet 30 Series TAV Systems. BANDO Belt 203591 (A-DF) Premium Heavy-Duty Go Kart Belt (Replaces Comet 203591). 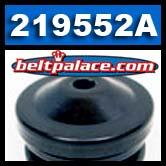 Replaces: Yerf Dog Belt Q-43203W, 04-320-3W and 5004-383, Kartco 7655, TCS10052, ROTARY 12-10052, Comet Belt #203-591. 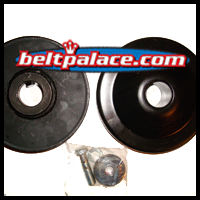 Replacement belt for 994-80: COMET 203591 and 203591A/DF. Replacement for 994-80 OEM Torq-a-verter belt. 3/4"top W x 28 21/64" L. Asymmetric Cogged belt. Also used in ATVs, Golf Carts, Mini-Bikes, and Power Scooters.